The recent 9.0-magnitude earthquake in Japan and the devastating tsunami that followed are likely to lead to widespread mental health problems in survivors. Based on our research with earthquake survivors in Turkey, we would expect traumatic stress problems severe enough to require treatment in more than 50% of the people with high levels of expoure to trauma exposure . Such a high rate can be attributed to mainly 3 types of stressor events experienced by the Japanese people: (1) earthquake tremors, including the initial major shock and the aftershocks, (2) the devastating impact of the tsunami, and (3) threat of exposure to radiation from damaged nuclear plants. Our research shows that prolonged exposure to earthquake tremors is a more important risk factor for traumatic stress than exposure to the devastating effects of earthquakes. In other words, people do not need to have suffered or witnessed the devastating consequences of an earthquake to develop posttraumatic stress; mere exposure to earthquake tremors is sufficient. Among natural disasters, earthquakes probably cause most psychological damage, mainly because of their unpredictable and uncontrollable nature. Earthquake tremors cause intense fear – possibly reflecting their evolutionary significance in human history – and often lead to pervasive fears many of which are irrational and beyond cognitive control. This implies that the mental health problem caused by earthquakes is likely to be far more extensive than that caused by the tsunami. This is because the tsunami – no matter how devastating it might have been – is a single traumatic event and lacks the strong element of unpredictability and uncontrollability that earthquakes possess. On the other hand, exposure to radiation possesses the same characteristic and thus likely to be another serious risk factor for traumatic stress in the short- and long-term. Repeated exposures to uncontrollable stressors often lead to intense fear-related traumatic stress problems – most commonly hypervigilance, startle reactions, sleeping difficulty, avoidance of situations perceived as dangerous or that bring back trauma memories, intrusive recollections of trauma events, flashbacks, nightmares, memory and concentration difficulty, and depression. Secondary substance abuse and suicidal ideas might also occur. Fear and avoidance problems are likely to permeate every aspect of life and cause significant impairment in work, social, and family functioning. Japanese people’s response to the threat of radiation highlights the importance of fear and avoidance symptoms among other manisfestations of traumatic stress. Many people are leaving Tokyo, despite the fact that there is little serious risk of significant exposure to radiation. This can be attributed to fears (fuelled in part by the media) of a largely irrational nature. This goes to show how fear and avoidance after disasters can impact a society, leading to events of considerable social, economic, and political significance. The overall economic toll of the disaster in Japan so far is said to exceed 170 billion USD. In view of the fact that Japan is the third most important economic power in the world, the impact of this disaster is likely to be felt around the world. Whatever the final toll may turn out to be, loss of productivity in Japan’s trauma-exposed work force arising from prevalent traumatic stress reactions is likely to incur additional economic costs if the psychological problems are left untreated. After the 1999 earthquakes in Turkey the psychological impact of the disasters was distinctly felt in work places, businesses, and factories in both the short- and long-term. Indeed, these organizations were among the first to seek treatment for their employees. Fear-related traumatic stress, avoidance of trauma reminders or situations that signal further threat to safety, and depression secondary to pervasive fear are often the primary causal factors in impairment in work, social, and family functioning. It is worth noting that the rates of Posttraumatic Stress Disorder (PTSD) reported after such disasters underestimate the actual prevalence of functional impairment among survivors. Many earthquake survivors who do not meet the criteria for PTSD still have significant functional impairment. Indeed, during our work with earthquake survivors in Turkey, 35% of survivors who sought treatment from us did not have the required number of symptoms to meet the criteria for PTSD. Nevertheless, they had functional impairment sufficiently severe to require treatment. Japan is a technologically advanced country and known for its high levels of preparedness for earthquakes. Furthermore, Japanese people are said to be resilient and experienced in dealing with the earthquakes. Indeed, our own research shows that repeated exposures to earthquake tremors coupled with effective coping strategies enhance people’s resilience against the traumatic impact of earthquakes. However, a disaster of this magnitude, possibly the worst in living memory in Japan, is likely to traumatize even resilient people. Possible functional impairment in over 50% of disaster-exposed population, if left untreated, may mean non-negligible problems for Japanese economy. Although the Japanese society and culture provides strong social support networks for its members, there is not sufficient evidence to show that social support alone is sufficient for recovery from trauma. The latter requires specific psychological interventions that reverse psychological processes responsible for development of traumatic stress. Furthermore, the memory of this disaster may make Japanese people more vulnerable to the traumatic impact of future earthquakes, if appropriate measures are not taken to help them overcome this trauma and increase their resilience. Widespread posttraumatic stress problems may also have important social and political consequences for Japan. Our research shows that earthquake trauma has a significant cognitive impact in over 90% of the survivors, leading to attributions of blame to people (mostly local and central government authorities), rather than to natural causes. Anger, resentment, demoralization, and loss of trust and faith in the State are very common, often associated with perceived inadequacy of rescue and relief efforts, lack of redress or compensation for losses, or dissatisfaction with the way the authorities generally handle the disaster situation. Indeed, there are already reports of people leaving Tokyo, distrustful of official statements about the state of nuclear plants. Trauma-induced cognitive changes and associated negative emotions may not only adversely affect productivity in the workplace but may also lead to distrubances in social order. Resentment, anger, rage, and other negative emotions directed at authorities may even affect voting behaviors. Effective dealing with the mental health consequences of a major disaster such as that occurred in Japan requires a mental healthcare model that is capable of addressing millions of survivors in a cost-effective fashion. Such a model requires effective psychological treatments that are suitable for dissemination through media other than professional therapists, such as lay people, self-help tools, and mass media. Current treatments for trauma have certain shortcomings (e.g. uncertain cross-cultural applicability, lack of sound theoretical basis, long duration of treatment, etc) that limit their usefulness in post-disaster work. Most importantly, none of these treatments can be delivered through self-help tools without therapist involvement. Even the most effective treatment is of limited use in the aftermath of large-scale disasters if it cannot be widely disseminated to millions of people in need of help. Japanese mental health professionals need to bear in mind that experience with disasters of this kind in the western world is limited. Moreover, psychiatric medications are not likely to be of much help, as they are of limited use in treating traumatic stress problems. 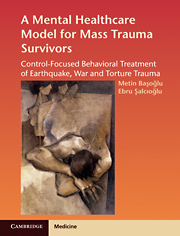 Our work with survivors of the 1999 earthquakes in Turkey shows that fear-induced traumatic stress can be reversed by a simple psychological intervention (Control-Focused Behavioural Treatment – CFBT), which involves mainly encouragement for exposure to anxiety-evoking trauma reminders or memories until sufficient sense of control over anxiety develops. The development of CFBT was inspired in part by our observations of natural recovery processes in war, torture, and earthquake survivors. Examining how survivors coped with debilitating trauma-induced distress or fear of reliving the trauma, we discovered that many survivors, without any guidance from a therapist, made a point of confronting feared situations (e.g. entering concrete buildings) to overcome their fear. Such examples of self-instigated exposure to trauma reminders can also be observed in other trauma survivors. For example, many road traffic accident survivors who are reluctant to drive for fear of another accident make an effort to start driving again soon after the accident, thinking that surrendering to their fear means they may never be able to drive again. These observations suggest that self-help is not only a viable approach in survivor care but also one that carries great potential. Using a persuasive treatment rationale (i.e. beat your fear or surrender to it and live your life in misery), CFBT simply provides a motivational impetus for a naturally existing tendency in people to confront feared situations as a means of overcoming fear-induced helplessness. CFBT is fundamentally different from other similar (exposure-based) treatments in aiming at increased anxiety tolerance and control over (or resilience against) traumatic stressors, rather than mere anxiety reduction. Most psychiatric and psychological treatments developed in western countries aim at anxiety reduction. Evidence points to anxiety tolerance and sense of control over traumatic stressors as a more important process in recovery from traumatic stress in earthquake survivors. Furthermore, anxiety reduction is not a realistic therapy aim, considering the prolonged nature of traumatic stressors following the initial major earthquake (e.g. aftershocks). Thus, with its focus on resilience, CFBT represents a radical departure from traditional approaches to anxiety that characterize most western treatments. Evidence shows that reduced avoidance of trauma reminders result in increased tolerance of and sense of control over trauma-induced distress or fear, which in turn lead to improvement in traumatic stress symptoms, depression, and functional impairment. Field trials have shown that CFBT achieves marked improvement in 90% of earthquake survivors with PTSD. While CFBT can be delivered in a single session in 80% of survivors, up to 4 sessions may be required in some cases. We found single-session CFBT to be even more effective when survivors are helped to tolerate and develop resilience against frightening earthquake tremors in an earthquake simulator – a finding which led to the development of Earthquake Simulation Treatment. Preliminary evidence also suggests that CFBT can be effectively delivered through a self-help manual. Such evidence helped us conceive a self-help model of survivor care that entails cost-effective dissemination of treatment knowledge through all possible means, including professional and lay therapists, self-help tools, and mass media. Two manuals concerning earthquake trauma were developed to facilitate cost-effective dissemination of treatment knowledge to care providers as well as to survivors themselves. “Perhaps the most exciting prospect afforded by CFBT is its dissemination through mass media, such as TV, radio, and newspapers. While this might come across as an ambitious idea, evidence suggests that it is well worth exploring in future research. There are three conditions that need to be met for effective mass dissemination of a behavioural intervention. First, the intervention needs to prescribe particular behaviours, which, when executed, reduce traumatic stress. Evidence reviewed in this book shows that not avoiding or self-exposure to trauma cues achieves this effect. Second, the prescribed behaviours need to be presented with a rationale that overcomes helplessness (anxiety) and hopelessness (depression) cognitions to a sufficient extent so that a person is motivated to execute the prescribed behaviours. Evidence from our treatment studies shows that CFBT rationale achieves this in 80% of the cases. Third, the treatment rationale needs to achieve the same impact, when delivered by media other than a therapist. Evidence suggests that this is possible with CFBT in about 50% of the cases, consistent with other evidence showing that the therapist is not always essential for effective delivery of fear-focused interventions in anxiety disorders. CFBT reduces traumatic stress and depression through reducing helplessness induced by unpredictable and uncontrollable traumatic stressors. As such, it is a resilience-building intervention. Its effects generalize to all problems domains, including functional impairment in work, social, and family life. Our research shows that cognitive effects of trauma of the kind described above are secondary to traumatic stress. In other words, survivors’ altered beliefs about justice and trust and associated emotions of anger, rage, demoralization, etc stem from fear-induced traumatic stress and not the other way around. This implies that helping survivors overcome their fear and related traumatic stress problems may result in restoration of their beliefs about justice and trust and a reduction in associated negative emotions. There is indeed literature evidence to this effect. This in turn implies that mass dissemination of CFBT may be helpful in facilitating collective recovery from mass trauma and social reconstruction efforts.